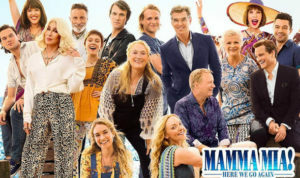 Opening the musical Mamma Mia 2 in the middle of an unseasonably sweltering, summer, is brilliant marketing—especially if your vacation plans are late August as you’ll be transported to a gorgeous fresh sea-breeze, sun-kissed, blue-hued vacation paradise— Kalokairi in the Greek Isles. In Mamma Mia (2008) Meryl Streep plays the older version of Donna, whose daughter Sophie (Amanda Seyfried) is grown up and married—sadly in the sequel, Donna has passed away. Although no worries here, Streep does make an appearance near the end of the movie for a poignant musical number with Seyfried that may bring a tear or two; she’s also in the finale. Effectively, this light and airy film is both a prequel and a sequel. (L to R) Young Tanya (JESSICA KEENAN WYNN), Young Donna (LILY JAMES) and Young Rosie (ALEXA DAVIES) in “Mamma Mia! Here We Go Again.” Ten years after “Mamma Mia! The Movie,” you are invited to return to the magical Greek island of Kalokairi in an all-new original musical based on the songs of ABBA. Offering mega ABBA themed songs and dance production numbers with the addition of new catchy tunes, the highlight is the dynamic new lead—Lily James, the talented Cinderella (2015) star has exchanged her glass slippers for platform knee-high boots while brightening the screen with her infectious carefree energy. James plays Donna as she’s graduating from Oxford College in 1979 at the beginning of the film; with her girlfriends, Tanya (Jessica Keenan Wynn) and Rosie (Alexa Davies) who in the future are the singing trio “Donna and the Dynamos.” Also, we view her short-lived romances with Sophie’s three fathers, Harry (Hugh Skinner), Bill (Josh Dylan), and Sam (Jeremy Irvine). Lily James (Sophie) “Mamma Mia: Here We Go Again” Universal Pictures. English director Oliver “Ol” Parker whom shares screenwriting credit had one objective—to create a sequel grander than the original, in a brilliant move he wrote the part of Donna’s grandmother (Ruby Sheridan) with Cher in mind—And truthfully, if anyone can ‘raise the bar’ in a musical—it’s the one and only showstopper—the legendary Cher. Her entrance is thrilling, the singing of the ballad “Fernando” alongside Andy Garcia (Señor Cienfuegos) who shares a past romance with Ruby, is spine-tingling. The message is clear; focusing on family bonds brings joyfulness all while following your heart—with strong undercurrents of feminine strength, passion, and love. 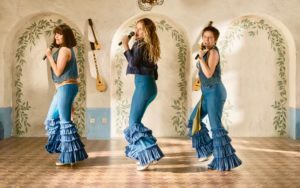 Tugging at all the heartstrings, the film delicately balances emotions while belting out entertaining songs and toe-tapping choreography. In showcasing the wardrobe, costume designer Michele Clapton, known best for Game of Thrones and The Crown provides a glittery banquet feast to behold; she has worked her magic with the costumes. Check out the details of the accessories from suede fringed 70s purses to colorful silk sashes and the shiny gold platform heeled knee-boots. All of Cher’s costuming was a collaborative effort with the icon herself—stunning is the word that comes to mind in describing her wardrobe. As in Oceans 8, (2018) the clothes indeed are worth the price of admission—each costume is unique to each character capturing their individual personas to a tee. Swaying back and forth between the late 70s and current times the film flows beautifully, the transitions are natural—developing the story with just the right amount of time devoted to each period yielding a gradual approach. The “Waterloo” song and dance French restaurant scene and costuming are spectacular as that scene is with young Harry and Sophie. Fast forward to Harry (Pierce Bronson) as dad singing “SOS” in the future—yet I found the song choice odd as he needed major SOS help in the last film as his singing was off-key, many critics brutally moaned. His singing here is confident, and on-key—a deliberate move as Bronson clearly redeems himself. Undoubtedly the most challenging scene was the “Dancing Queen” choreography in which over 150, mostly fishers in boats came sailing in dancing and singing to the grand re-opening of the Hotel Bella Donna. It’s reminiscent of the ambitious LA freeway song and dance car scene in La La Land (2016) to the tune “Another Day of Sun.” The celebration of pure joy and the capacity to display grief with the juxtaposition between them creates bonding with not only the audience but between characters. No wonder my audience clapped, sang and shed a few tears. * It’s been ten years since the sequel, the film takes place only five years later. * The name Kalokairi is a fictitious name in the Mamma Mia series. * Cast members from prior play productions were asked to take part in the “Dancing Queen” scene.